Justice League: Throne of Atlantis is a direct-to-video animated superhero film featuring the DC Comics superhero team the Justice League, which is part of the DC Universe Animated Original Movies. 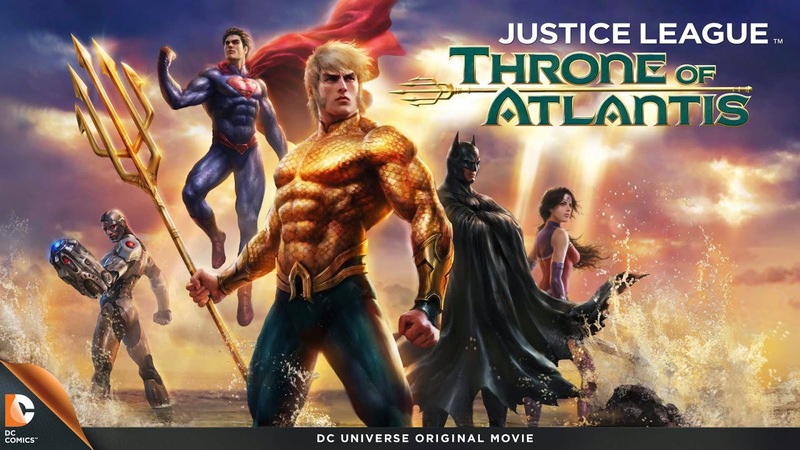 The film is loosely based on the Throne of Atlantis story arc from The New 52 written by Geoff Johns and serves as a sequel to 2014's Justice League: War. In the film, Arthur Curry, a half-Atlantean prince, discovers his heritage and aids the Justice League to prevent a disaster by his half-brother Ocean Master, claim his throne, and subsequently becomes Aquaman. Jason O'Mara, Christopher Gorham, Sean Astin, Shemar Moore, Steven Blum, George Newbern and Melique Berger reprise their respective roles from Justice League: War, while Nathan Fillion reprises his role as Green Lantern / Hal Jordan from Green Lantern: Emerald Knights, Justice League: Doom and Justice League: The Flashpoint Paradox. In the Atlantic Ocean, the USS California submarine picks up incoming human-like threats approaching the sub by sonar. The sub is attacked, leaving the entire crew dead by the invading hostiles. At S.T.A.R. Labs' Justice League headquarters, Cyborg is given news by Colonel Steve Trevor over the sunken sub. Cyborg decides to check it himself, deciding against Trevor's idea of calling the other superheroes, as he puts it "there is no Justice League". At Mercy Reef, Arthur Curry, drunk over the recent death of his father, picks a fight with a group of tough guys over them wanting to eat the lobster Arthur was talking to. He defeats them, but he is being watched by Mera and Dr. Shin. At the sunken sub, Cyborg discovers hand prints on the hull and that several nuclear missiles are missing from the launch bays. He is then attacked by the same hostiles that attacked the sub and suffers damage through his escape. Back at their HQ, Cyborg gets help from Flash and Shazam to get Superman, Wonder Woman, and Green Lantern, leaving Batman the last one remaining. Green Lantern decides to head to Gotham City to get Batman, who is currently chasing henchmen of the Scarecrow. Green Lantern captures them for Batman, but Batman is angry as he needed them to head to where Scarecrow was. With the entire team together, they check the raised sub and Cyborg's assault. They realize the enemy is not related to Darkseid but warriors from Earth's origin. Thanks to Diana's knowledge, she reveals these warriors are from Atlantis with the theory of war related to the missing missiles. Using Shazam's suggestion, Superman and Batman decide to meet Atlantis-expert Dr. Shin, while the others are tasked in finding Atlantis. At Atlantis, Prince Orm and Black Manta meet with Orm's mother, Queen Atlanna. They argue over declaring war on the surface world because of the damage during the events of Darkseid's attack, and Atlanna asks Mera to bring Arthur, her other son, to Atlantis. Black Manta uses a fake submarine to attack Atlantis using the same stolen missiles, framing the surface for their "unprovoked" attack. Arthur answers the door to Dr. Shin, who tries to tell him that his father contacted him before his death to help Arthur. Moments later, Dr. Shin is killed by Atlantean soldiers. Arthur is overwhelmed by the attack until he is saved by Mera. Batman and Superman enter Dr. Shin's home discovering that his work is destroyed. Superman recreates a photograph of Arthur Curry and a letter from his father revealing that his son is half-Atlantean. Batman decides they must find him. The attack on Atlantis leads the citizens to demand for war, but Queen Atlanna decides that they might need to reveal themselves after centuries of being hidden and contact the Justice League. Arthur wakes up underwater next to Mera who reveals the situation: Atlanna met Arthur's father and gave birth to him. But because of royalty, she could not be with him nor Arthur, so she had to leave to be with her king and Orm. Now, Atlanna believes Arthur can help Atlantis be the bridge between the two worlds. Mera shows him ancient ruins where she dresses him with his royal garb. Arthur can't take the news and heads to surface with Mera following him. Soon, they are attacked by the Trench. The battle is tough with Arthur bleeding for the first time in his life. The Justice League arrives in time to defeat the Trench. Orm hears from Black Manta that the Trench failed to kill Arthur. Orm and Queen Atlanna argue because Orm wants to start a war as per his late father's wishes and reveals his knowledge of Arthur Curry. Queen Atlanna reveals to him that she knows he attacked Atlantis. With this news, Black Manta and Orm murder Queen Atlanna and take over. Arthur, Mera, Superman, Wonder Woman, Green Lantern, and Cyborg arrive at Atlantis and learn of Queen Atlanna's death and are defeated by Orm, who has now become the super villain "Ocean Master". The group is sent to be consumed by the monstrous Dark Trench, while Ocean Master leads Atlantis' army to the surface. Arthur breaks from his bonds and with Superman's help, they save the rest and defeat the monster. In Metropolis, a massive tidal wave is used to conceal Ocean Master's army, which reaches the shores and begins their attack. The military fights back but are powerless until the League arrive. During the fight, Superman saves John Henry Irons, and Wonder Woman saves Lois Lane and Jimmy Olsen. Arthur is attacked by Black Manta, who reveals that he manipulated Ocean Master and plans to kill him when the time is right and take Atlantis for himself. While Black Manta is revealing his plan, Arthur calls a megalodon to attack him, killing Black Manta. Mera and the League attack Ocean Master but are unable to gain an advantage over him due to the magical trident he wields. Arthur becomes the last to face Ocean Master, who has an upper hand during the fight until the end. Batman saves Cyborg from dying, and Cyborg reveals that he has video of Ocean Master confessing to killing his mother when they were captured. Cyborg broadcasts Ocean Master's confession all over Metropolis for Atlantis' soldiers to see. Stunned by his treachery, the soldiers turn against Ocean Master and Arthur uses the distraction to defeat him. He then convinces the soldiers to stand down and declares his desire to bring Atlantis and the surface world together in peace. Later in Atlantis, Arthur is crowned as king, with the Justice League among the audience celebrating. Batman suggests that with new threats appearing, they need to solidify the team and Cyborg reveals plans for a watchtower. Arthur joins as Aquaman (which is a nickname everyone on the Internet gave him and he hates), and soon heads with now-love interest Mera against the Trenchers outside Atlantis. In the post-credits, Ocean Master is incarcerated at Belle Reve. He is approached by Lex Luthor who has a proposition for him to consider.